You can record attendance statistics for previous months or years so that you can create reports for your historical attendance – even if they were recorded in another Church Management System or by hand. You can achieve this by adding and editing multiple services for previous services. To add in a total number of adults for the past service attendance for your church, you will need to create a custom reporting field in Service settings – see the ‘Custom Statistics’ heading in our How to Track Service Reporting article. To record service attendance for previous services, you’ll firstly need to add services from the Services area. Depending on the level of detail you require, simply add in a service for every interval (i.e. monthly/yearly intervals) you would like to report on. In this example, we want to put in attendance figures for services created at the last Sunday for each month. Since you’ve created multiple Services, you’ll be directed to the ‘Edit Multiple Services’ page. Read more about Editing Multiple Services. Once the page loads, open up the ‘Services Reporting’ section. 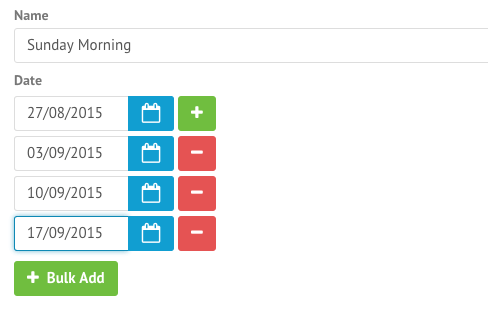 After adding your services, you can edit the Service Reporting one by one. This can be a massive task if you decide to record weekly, which is why recording in monthly or yearly intervals may be the best option here.